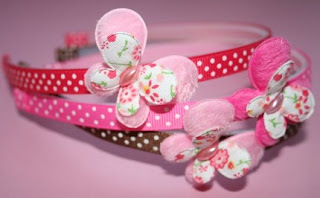 Damsel in a Dress has the cutest hair accessories perfect for little girls and great prices too. I can picture my Bridget in any of these adorable clips or headbands. 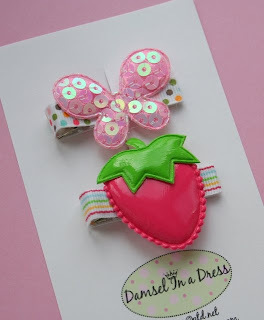 These hair clips are called Strawberry and Butterfly. I also like the Butterfly Headbands. I am a stay at home mom with two kids and live in the Lehigh Valley of Pennsylvania. My son is 5 and my daughter is 4. We all have a great time together, and can hardly wait for spring so we can spend much more time outside! In February of last year I was in desperate need of a hobby/outlet while stuck inside with my kids on yet another dreary winter day. While browsing hair clips online for my daughter I realized that I could make just what I was looking for. I started researching, collected my ideas and I was soon in business. For months I would sell to other moms at preschool pick up/drop off and found that I was selling them as fast as I could make them. Word spread fast and from then on would always carry my wares with me. I started selling to a few local boutiques, at fairs, and on etsy. I have been making my clips for just about a year now and this past fall started with headbands. I love it! I have always loved creating and visuals. I have my Bachelor of Fine Arts and worked in the Interior Design business before having our kids. I enjoy cooking, crafts, painting, interiors, and reading. I hope you enjoy what you see as much as I enjoy making them! 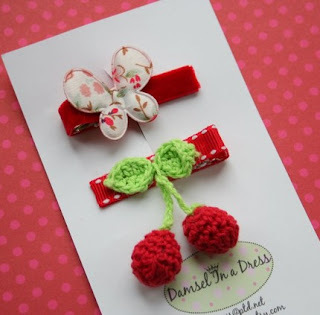 Damsel in a Dress would like to give one of my readers a $20 gift card for her shop.